This is the first course in Scotland offering a four-year Master of Occupational Therapy award. It has been developed in response to employer needs and key current policy and social directives. It will develop you into an Occupational Therapist who is; professional, resilient, creative, practical and dedicated to implementing contextually relevant occupational therapy services which promote and enhance health, wellness and quality of life for individuals and populations. The Guardian University League Tables 2018, published in 2017. You will develop a basic understanding of the relationship between the person, occupation, health and wellbeing and the environment. You will learn the determinants of health and wider psychosocial and cultural influences on health, health promotion and the theoretical and practical components of occupational therapy. Professional practice and identity is developed, alongside interprofessional learning opportunities undertaken. You will explore wider theory of the impact of health on human functioning, and the application of occupation-based practice within a range of settings throughout the life-span. 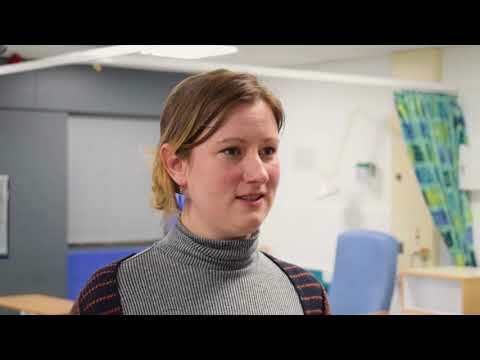 Interprofessional education, situated learning and practice placement opportunities develop clinical reasoning and critical thinking skills to underpin current and contemporary professional practice. You will have advanced opportunities to apply clinical reasoning skills and occupational therapy skills attaining proficient integration of academic theory and practice placements aligned with multi-professional study of research. You will develop your critical thinking, team working, and entrepreneurial skills in relation to professional practice and interprofessional learning, leadership and management. You will develop enhanced skills in critical and professional reasoning in relation to understanding new models of health care and provision of quality evidenced based, person-centred care. As well as interprofessional learning, you will undertake a research project and an elective placement. This course involves a mix of academic, practice-based and community situated learning experiences. You will attend lectures, tutorials and workshops, and practical sessions are taught within the purpose-built clinical skills and home setting environments, engaging with volunteer patients to simulate patient scenarios during teaching and assessment sessions. You will also be facilitated in CPD engagement and integration of skills of reflection and clinical reasoning with person-centred evidence-based practice. All academic staff teaching on this course are qualified Occupational Therapists or allied health professionals with a breadth of clinical experience gained in a variety of clinical and geographical settings. Teaching is also supported by contributions from industry from across and out with the profession or within appropriate community settings. Practice Placement experiences take place in a wide range of health, social care and third sector organisations throughout Scotland. The first four placements are sourced and predominantly arranged by the course Practice Placement Coordinator. The fifth is an elective placement sourced and arranged by you and may take place in traditional or contemporary emerging area of practice, either in the UK or internationally. To enhance your understanding of alternative healthcare systems and cultures, and to support your employability in the global workplace, an international learning exchange is offered in Stage 3 with LaCrosse University in Wisconsin, USA. A career in occupational therapy offers the opportunity to work in a dynamic and increasingly important area of health and social care. Occupational Therapists work in hospitals, social work services, rehabilitation units, housing services, schools, day care facilities, patient homes, third (voluntary) sector, prison service and addiction services. Additionally, with the Master’s qualification, you will have the enhanced skills and attributes required to strategically influence workforce planning developments and be equipped to provide evidenced-based, quality services within and beyond statutory sectors. This ensures your readiness for current and future practice, whatever direction you may decide to take. SQA Higher: BBBC to include English (or a written subject requiring the use of English) and one from a science or humanities subject. Maths and a science subject are required at National 5 level grade B or above if not held at Higher. GCE A Level: BCC to include English (or a written subject requiring the use of English) and one from a science or humanities subject. Maths and a science subject are required at GCSE grade 6/B or above if not held at A Level. Irish Leaving Certificate Higher: H2H3H3H3 to include English (or a written subject requiring the use of English) and one from a science or humanities subject. Maths and a science subject are required at grade O2 if not held at Higher. IB Diploma: 27 to include Higher Level English (or a written subject requiring the use of English) and one from a science or humanities subject. Maths and a science subject are required at Standard Level grade 4 if not held at Higher. HNC in Occupational Therapy Support may allow advanced entry into Year 2. I chose to study Occupational Therapy at RGU because both the university and the course had an excellent reputation, and being a mature student, choosing the right university with a high graduate employment rate was really important to me." "Being a student at RGU has offered me so many opportunities for personal development and hugely increased my confidence. The OT course offers an engaging and practical learning environment with really creative, yet professional ways to enable learning. The degree is a professional qualification which is accredited by the Royal College of Occupational Therapists and the World Federation of Occupational Therapists. It is also approved by the Health & Care Professions Council (HCPC). Registration with HCPC is a requirement of employment in the NHS and other statutory bodies; on completion of the Master of Occupational Therapy, you will be eligible to apply for registration with the HCPC. This Mental Health Nursing course will develop you into a skilled, confident Mental Health Nurse, equipped to deliver relationship and recovery-focused nursing, while taking into account the rights of the patients and their carers.